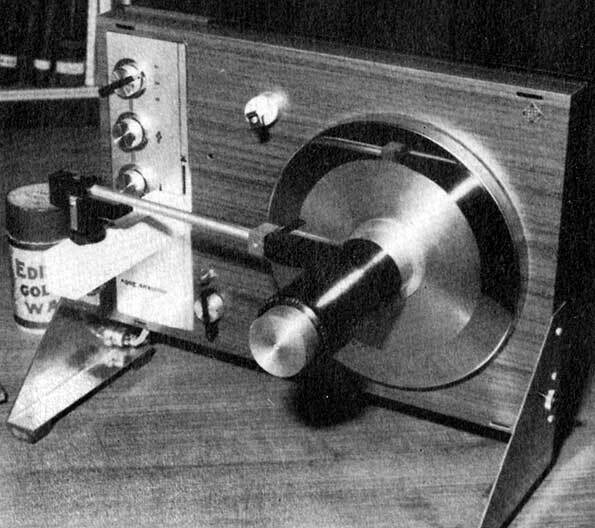 This fairly primitive cylinder player was probably made in the 1970s. It was constructed by Prof. Walter Bruch, the inventor of the PAL color television system. By using a cheap turntable, still suitable for 78rpm records, I built a player for Amberol and Blue Amberol Cylinders. The transmission had to be changed to 120 or 160 revolutions per minute (changing the voltage did also help a little bit for speed adjusting). A stereo pickup with both channels combined allows the use with vertical cut grooves. Wax cylinders require an additional feed and special styli to not destroy the grooves; nylon styli or - due to primitive testing - cactus thorns have turned out to be useable. By a closer look at the photo, I was able to figure out that the turntable is a German Telefunken Musikus 208V. Unfortunately there is no further information about the other necessary modifications such as the pre-amplifier or the mandrel. It may not be only coincidence that he used a Telefunken, because Bruch started his career there in 1935 and did work there for decades. Obviously (as depicted) Bruch also intended his player to be used with earlier 2-minute wax cylinders, brown wax included because of 120rpm. According to his description it is likely that he was having tracking problems without increasing the weight to a harmful value for wax. Therefore he came to the conclusion that there was no real way to play a wax cylinder without tracking assistance. As we know by today, several other players have proved him wrong. An extended arm would have certainly caused less trouble. I do also have reasonable doubts that cactus thorns did not cause any damage to wax cylinders, but maybe he used these needles for celluloid cylinders only. Nevertheless this attempt is another proof that different people often come to very similar ideas without knowing each other.